Who Asked Me? › Could’ve Should’ve Etc. 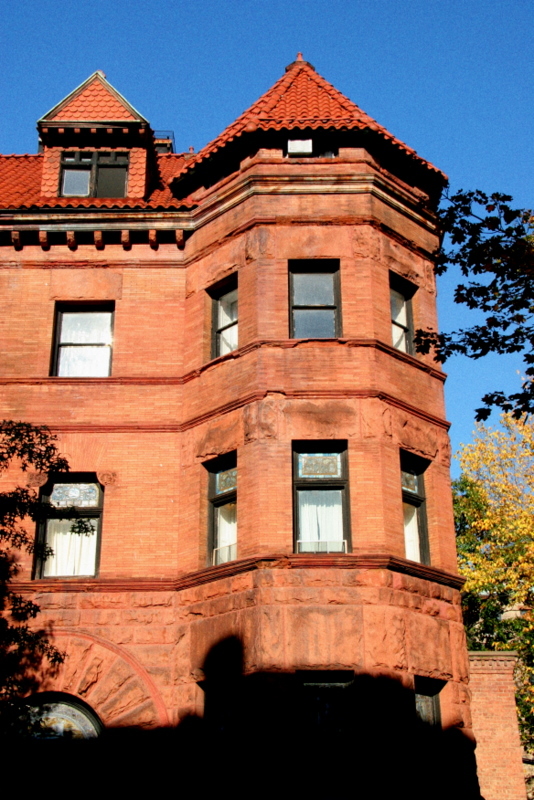 This is the Chiclets Mansion, also known as the Thomas Adams, Jr. House, at 119 Eighth Avenue in Park Slope, Brooklyn. I lived here for a spell in 2004 and even wrote about the experience. The mansion is converted in to apartments, and mine was just below the attic level and seen as the four upper, full-sized windows visible in this shot. Adams invented Chiclets gum, a veritable milestone in the non-digestible foodstuffs industry. I’m no architect, but from what I’ve read the house is considered to be one of the greatest examples of a privately-owned Romanesque Revival home in the city. For a short while, it also made me one answer to an often-asked Brooklyn trivia question: I wonder who lives in that place? The house also features the first example of an elevator installed in a private Brooklyn residence, and this became the center of a well-known ghost story. According to legend, three Irish servants got trapped and died in the elevator when the family was vacationing. I used the lift on a daily basis during my stay and can attest that it’s no space for a moderately fat person, let alone three Irishmen – so the details of the story are plausible even if they raise further questions. As to the ghost part, I can’t claim solid recollection of any “screams for help with heavy Irish accents” but I do recall several spooky moments. You try living in a place like this without getting creeped out every now and then. It’s all kind of foggy, but I think I was drinking a lot of Jamesons back then, so I may have confused ghost sounds with actual bartenders that I met. I took this picture on a recent, beautiful Fall afternoon in New York City. People have had kids for less-substantial reasons than the potential to walk by a place like this and tell them “I used to live there,” before transitioning in to Edgar Allan Poe mode. All of which is indicative of my frequent ‘should’ve’ thinking, which is similar to shouldn’t’ve thinking with the potential for greater ruminative regret. One of my more palatable should’ve’s is “should’ve bought a house by now,” but this likely would’ve subtracted from some varied living experiences and cost me at least one decent Irish ghost story. The game ain’t over yet. This was written by admin. Posted on Thursday, November 3, 2011, at 2:18 pm. Filed under Posting. Bookmark the permalink. Follow comments here with the RSS feed. Post a comment or leave a trackback. I really appreciate this story. My wife and I bought this building two months ago and are working on converting it back to a single family home. We hope to restore it to its original state and raise our 5 children in the house. Thank you again for the story. Thanks John. You’d need five children to fill that place up .. and I’m sure it’s a heck of a project restoring it. But what a beautiful old place. Good luck with the renovation. I’m the granddaughter of Elizabeth Adams. I only found out when she died an attorney called my father to let him know of his inheritence. Then when her son died, all 4 of us received the rest. I have never seen a picture of Elizabeth Adams. If the new owner of the Chicklet Mansion finds any picture would you please post it? I’d really appreciate it.